Exclusive! Glamour gals hit the beach! 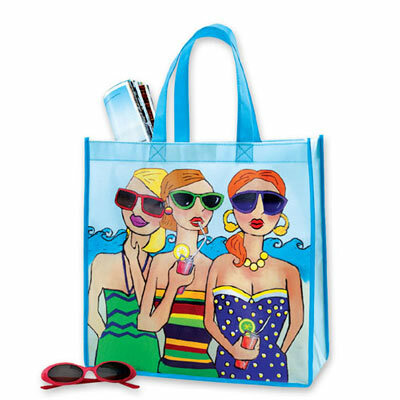 Practical, lightweight go-anywhere Girlfriends Tote is printed on both sides on non-woven polyester on durable non-woven polyester, coated for easy cleaning. Imported. 14"w, 12"l handles. I bought this to use as a gift for my neice and I think she will love it. It is unlined, but is very roomy. Open top, no closure. Very cute print on both sides. Am very happy.